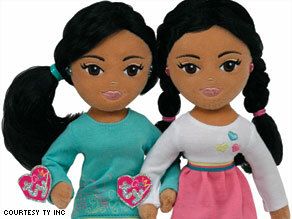 Ty, the maker of Beanie Babies, is introducing two new Ty Girlz dolls named Marvelous Malia and Sweet Sasha. WASHINGTON (CNN) – They’ve been in the White House less than a week, but the first daughters have already been co-opted by marketers — and Michelle Obama isn’t happy about it. Ty, the toy company responsible for the popular Beanie Babies dolls, is now marketing “Sweet Sasha” and “Marvelous Malia” dolls. The first lady’s office said Friday Ty was out of line. “We feel it is inappropriate to use young private citizens for marketing purposes,” said a spokeswoman for Michelle Obama in a statement. A Ty representative told CNN the company generally avoids naming dolls for “any particular living individual,” because doing so might interfere with how kids use their imaginations to play with them. But they wouldn’t reveal the source of their inspiration for the new figures, telling CNN that information relating to the development of the company’s merchandise - including how it comes up with products, product names, and trademarks – is proprietary. –CNN White House Producer Becky Brittain contributed to this report. Dear Lord all I am asking ..please bless and protect our Obama. I don't think that Ty should be permitted to capitalize on the president's girls with the sale of dolls. Ty, the maker of Beanie Babies, is introducing two new Ty Girlz dolls named Marvelous Malia and Sweet Sasha soon. I think this is a free market, but when it comes down to it not right in my opinion. If they don't want their daughters in the spotlight, stop being so public. When they pose for magazine covers, they are saying to the world that they, and their daughters, are a public commodoty. No problem with the liberal media dragging the Bush girls through the mud when they were still minors, right? But just try to make a doll that offends the Obamas and it makes front page news. Special treatment because they are black? I'd say. Now, does that make me a racist? You'd probably say so. The media is so in love with the idea of a part black president that the Obamas will get as much special treatment as the Bush's were given libelous slander. The election and the beginning of Obama’s first term looks like affirmative action for the office of the President of the United States. He remains is unvetted and unscrutinized by the media. For all of you "I still can't beleive you don't like Palin" people: you're a bunch of hypocrites. You're complaining about how her kids were brought out in the spotlight about the pregnancy and whatnot, and SHE had her kids with her. It's not like the media had to go and look for them. And is it the media's fault that she has a pregnant teenage daughter? No, not at all. She placed her kids in this position and she had every right to complain...and she did. Now you're getting upset because Michelle Obama is doing the EXACT same thing as Palin?? Get real. You hard right conservatives are all the same. It's only wrong if a democrate does it. But if you do the same thing it's o.k. Both Palin and the First Lady are mothers FIRST. And both MOMS have every right to defend their children. Both moms knew the impact that would befall their children should they decided to enter into the world of politics. Palin knew that eventually, she would have to defend her daughter's pregnancy. If she wasn't prepared to defend it, she could have very well kept her family hidden in Alaska while she campaigned with McCain. But she had them with her...and brought them on stage with her. It's the way of the media. Discussing and disclosing EVERYTHING...ESPECIALLY if this person has the intent to lead our country one day. If Obama had a preganant teenage daughter, she would have received the same criticism. But none of his daughters are pregnant. They're just kids. Palin just happened to have had a daughter who was pregnant. It's just that simple. Like I said...if she wanted that to be a private matter...she could have kept her kids hidden. But she didn't. Some of you people are just looking for anything to use an ammonition against President Obama. Get over it. Instead of whinning and witching, try supporting, so we all may benefit from what has been destroyed or taken away from us as American citizens. NOw as for Ty, of course this is all about making a profit from these little girls just like some of you that are in this blog if given the opportunity. NO, it is not right what this toy company has done and something should be done about it. I don't care if these children are public figures, the fact is they are still children and exploitation is still exploitation. For once, can't you people drop your hated for the 1st family because of the color of the skin? When are you ever going to get over that or is the seed from the bowels of hell that deep in your soul? Wow, so much discussion over such a trivial issue. The family should have been consulted, the company should not have made up such a bogus story. But unfortunately for the two little girls, they are public figures, just as the Bush, Clinton, Carter, Nixon, Johnson, Kennedy kids were. The kids are stalked, guarded, photographed and seem to develop normally. The country has much more important issues than this, you don't like the dolls, don't buy them. fearul for my country: You are an idiot. Oh, and now you know how the decent people in this country felt when the Bush regime came into power. AA's are a lot easier to please that some whites. And don't forget, it is beause of many whites that Obama is president. It wasn't just AA's who voted for him. For once, America was a rainbow coalition of voters voting for the better candidate. I find it amazing that there are people who espouse such racial sentiments as appearing in some comments. Yes, the parents paraded them during campaigning. Who wouldn't show off their kids? But does that mean the kids become fair game? I don't think so. If they had hidden the kids during elections, the world would have negative perceptions. They didn't use their kids to get votes. They appeared with them in public like every family would do. Please have a heart and remember these are two innocent kids. Just because it was done to Palin's kids does not mean it is right or the fact that the Obama's appeared in public with their kids does not mean Ty can abuse them like that. Lets not comment out of hatred for the Obamas. Let's comment based on our moral convictions. All of you people griping that the Obamas wore clothes specially designed for them by comparing them to the Palins are leaving out a really important detail – THEY PAID FOR THEM THEMSELVES, out of their own hard-earned money, unlike the Wasilla hillbillies. If the Obama daughters were sports figures or Hollywood actors they would have attorneys protecting their rights and bank accounts. I don’t remember seeing a doll based on the Clinton or Bush daughters. This subject brings up, once again, a person’s right to privacy, as well as the difference between what parents do and what children are exposed to. Ty is out to make a profit, if I were the Obamas and couldn’t stop the sale of the dolls, I’d make sure the profits went to needy children. However, Ty has made a huge blunder and should apologize and deal with this situation honorably. Next Ty Inc. will have the whole Obama family and the new dog in production for sell, would I purchase, don't know, however, I believe Ty has hit a gold mine.